Back in June I mentioned that the Golden Baobab Prize was calling all African Writers to submit to their prize for Children's Literature. 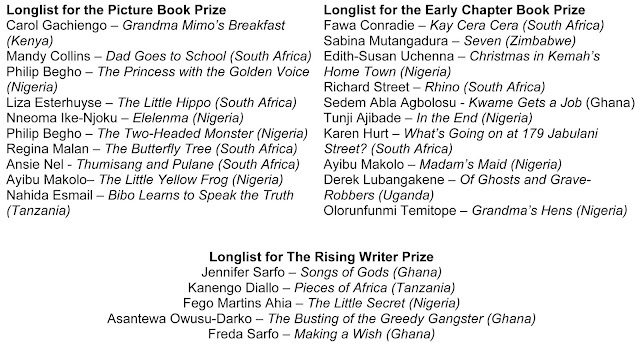 Well, on August 30th, the 2013 Golden Baobab Prize longlist was announced. As someone who had the pleasure of being part of the Reading Team for the Early Chapter Book and Rising Writers Prizes (all stories were anonymised so I had no idea who the author's were or where they were from), it was a really great experience getting to read unpublished manuscripts and a joy when I read some absolute gems. So on Sunday evening, when I heard the longlist had been announced and went on the website to check out who made the list, I was extremely happy when I saw that some of my favourites made the cut. I was also extremely surprised when I found out how young some of the Rising Writer's were. Congratulations to all the authors who made the longlist. But also if I may, a big thank you to Golden Baobab for what they are doing - creating a space in which African voices can not only be heard, but shared, in the world of Children's Literature. That to me is a beautiful thing. So thank you!! The prize, celebrating its 5th year, was set up to inspire the creation of enthralling African children's stories. Golden Baobab offers three prizes: The Golden Baobab Prize for Picture Books, The Golden Baobab Prize for Early Chapter Books and The Golden Baobab Prize for Rising Writers. The Golden Baobab Prize for Picture Books and The Golden Baobab Prize for Early Chapter Books is open to all African citizens. The Golden Baobab Prize for Rising Writers is open to budding African writers under the age of eighteen years. "Golden Baobab is really excited about this year's stories and we are looking forwards to growing further by publishing a collection of these amazing stories we have received. We are currently looking to partner with corporations that share in our vision to being these stories to the doorsteps of African children everywhere." The longlist had the strongest representation from Nigeria and South Africa. Other countries that featured were Zimbabwe, Ghana, Kenya and Tanzani. Phillip Begho and Ayibu Makolo, both Nigeria, had two stories each on the longlist. 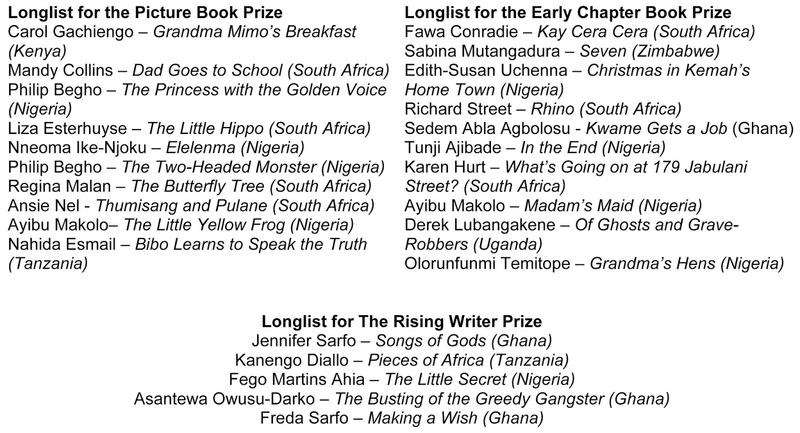 Below is the longlist and you can also read summaries of the stories and the author's bios on Golden Baobab's blog. The shortlist for Golden Baobab Prizes will be announced on 30th October and the winners will be announced on 13th November, 2013. Past winners of the Golden Baobab Prizes have included Joy Nwiyi from Nigeria, Jenny Robson from Botswana and South Africa and Rutendo Chabikwa from Zimbabwe who won the 2012 Rising Writer Prize. Also here's a recent interview with Deborah Ahenkorah, Co-founder and Executive Director of Golden Baobab, on Creative Writing Ghana.